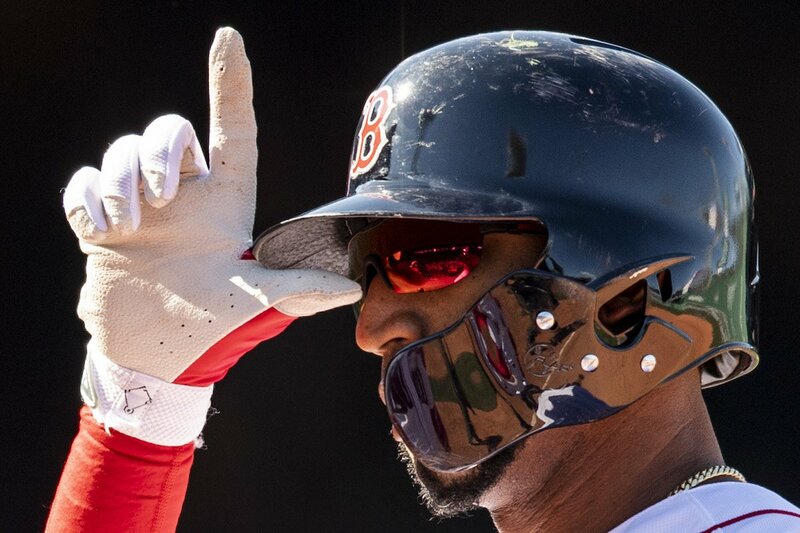 Eduardo Nunez performs the "Take the L" dance. The Red Sox haven't been shy about putting on their dancing shoes over the last few seasons, and they weren't going to stop this year. Mookie Betts has taken over the habit of pretending to sprinkle salt to the dugout after a hit, mimicking the famous videos of "Salt Bae" while the outfield has performed everything from the Carlton dance to some of Michael Jackson's moves in their "Win, Dance, Repeat" dances. But with the retirement of "Win, Dance, Repeat" the Red Sox have a new clubhouse dance, originating from shortstop Xander Bogaerts. After an opening day double, Bogaerts turned to the Red Sox dugout and broke out the newest move, straight out of the game Fortnite. The move consists of making an L with your thumb and forefinger, then placing it on your head and waddling your feet on both sides. Fortnite is a third-person shooter game made by Epic Games which has quickly become the hottest game in the nation. Within the game, they are several dances, or "emotes", that can be used for fun or for mocking an enemy. The "Take the L" dance that Bogaerts adopted was one of the most popular moves. Along with Bogaerts, several other Red Sox members have started using the moves like they were in a battle royale. Infielders Eduardo Nunez and Rafael Devers used the "Take the L" dance along with Mookie Betts after Bogaerts' grand slam against Tampa Bay. Hanley Ramirez broke out the "Best Mates" dance from the game after a double he hit earlier in the year. Bogaerts has now been playing the game for several months now, and his teammates have been starting to join him. During spring training and road trips, Eduardo Rodriguez, Carson Smith, Matt Barnes, David Price, Craig Kimbrel and Heath Hembree have all played together. When the team plays a squad match, they follow the undisputed best player, Carson Smith. Smith organizes where the team lands on the map, whether its a major location or a low-key spot. "It's actually a place we call 'Scar Factory,'" Smith said. "It's an unnamed location just next to Flush Factory." Smith claims the team has amassed around a dozen squad wins throughout their time playing and has provided a solid team bonding activity for the players. "This game is all about helping out and having fun at the same time," Bogaerts said. "I play baseball as a team, so I like playing in squads." As if the dance moves will continue, Bogaerts did not know if something new would come up, and he did not rule breaking out any new moves. "It's early on," Bogaerts said. "Who knows what we'll be doing next? But right now, we are doing that, and we are enjoying that so far."